Die Wertschätzung der Menschen und deren Arbeit entlang der Produktionskette ist uns ein Anliegen. Dies spiegelt sich in der Qualität der Produkte wider. 3FREUNDE produziert ihre Fairtrade-Bioshirts für Schulen und andere Bildungseinrichtungen individuell und für jede Gelegenheit. FREISTUNDE-Shirts sind bestellt und wir freuen uns, sie euch schon bald als Dankeschön zukommen zu lassen. We would like to thank 3FREUNDE for its generous support in the production of our DOING NOTHING ALL DAY and FREISTUNDE T-shirts. 3FREUNDE runs its own textile facility, where T-shirts and hoodies are produced using exclusively certified organic, Fairtrade cotton. The company ensures that workers at every stage of production receive fair pay and treatment for their contributions. This philosophy is reflected in the high quality of the products. 3FREUNDE produces its customised, Fairtrade, organic shirts for schools and other educational institutions for any occasion. 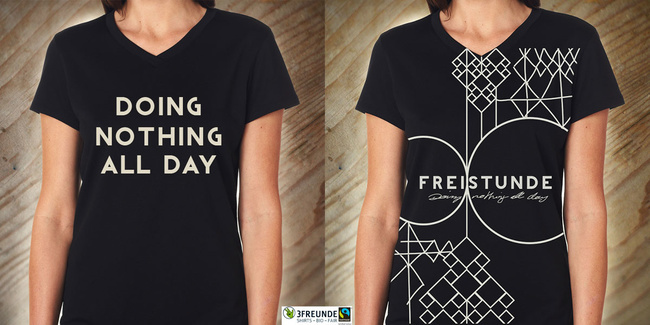 FREISTUNDE shirts have already been ordered, and we’re looking forward to sending them to you soon as thank-you gifts.